The hypothetical relationships of the major lineages of Buprestoidea. This group of beetles is generally considered to be monotypic, comprised solely of the family Buprestidae, one of the eight largest families of Coleoptera. The buprestids are generally known throughout the world as jewel beetles, but in North America they are termed metallic or short-horned (in contrast to the cerambycids) wood-boring beetles. As the latter common names suggest, these insects are wood-boring as larvae, with the immature forms slowly tunneling through a variety of woody tissues of many tree and shrub species. However, a large percentage of the family is instead stem- or leaf-mining, many having been erroneously combined taxonomically due to misperceptions about convergent adult morphologies. From studies of larvae, pupae and host associations, it is becoming clear that leaf-mining may be a derived strategy that has evolved independently at or near the apex of several widely separated buprestid lineages. The family is world-wide, with species found on all continents including many Pacific islands. Two of the largest genera, Agrilus (one of the largest genera in the world with nearly 3,000 described spp.) and Chrysobothris, are cosmopolitan; two others, Anthaxia and Acmaeodera found on all continents except Australia; Sphenoptera with more than 1,100 species found only in Palaearctic, Afrotropical and Oriental regions. Adults: body elongate, cylindrical to dorsoventrally flattened; integument generally strongly to somewhat irridescent, punctate and often with short setae; mouthparts generally hypognathous; eyes widely separated; antennae generally "11-segmented", distal antennomeres usually triangularly serrate; pronotum mostly wider than long; elytra elongate, lateral margins attenuate to apex; metacoxal plate much wider than long; first two abdominal sterna connate; five tarsomeres. Larvae: generally very elongate, head generally small, somewhat retracted into prothorax; antennae small, three segmented; without ocelli; mandibles robust, usually dentate; three segmented thorax lacks leg structures; prothorax swollen laterally, dorsal and ventral sclerotized plates; dorsal plate generally with distinct V- shaped median groove; spiracles prominent, cribriform and mostly crescent-shaped; last abdominal segment with two apical lobes, in subfamily Agrilinae these lobes are sclerotized. In terms of our phylogenetic understanding of the buprestids, it seems to be now generally agreed that there are four major lineages: schizopodines, julodines, buprestines and agrilines. These four groups should be assumed to be the four subfamiles of Buprestidae, but there is compelling data to argue for familial status for one or two of these groups as well. This four lineage concept is rather stark in contrast to the last major subfamily scheme proposed by Cobos in 1980 where he outlined 13 subfamilies and suggested a 14th. Few attempts to use real phylogenetic analysis techniques to the family, as a whole or groups of taxa within, have been conducted, but these are emerging slowly and will undoubtedly increase as we try to make sense of such a large group of beetles. There are approximately 15,000 species placed within about 450 genera. The last global accounting of the family came in the six buprestid parts of the Coleopterorum Catalogus by Obenberger (1926, 1930, 1934a, 1934b, 1936, 1937) with a summary of the higher categories provided by Bellamy (1985). The most recent higher system has been proposed by Holynski (1993) in which he suggested the four subfamilies, 12 tribes and about 64 subtribes. This classification was the first attempt to organize the entire family since that by Kerremans in 1893. Unfortunately, most of Holynski’s novel ideas are unsupported by any current methodology and the few subsequent attempts to test certain groupings has shown better congruence to more traditional views of relationships (e.g. Bellamy 1996, Bellamy & Westcott 1996, Bellamy & Williams). One of the four major lineages, the schizopodines, has sometimes been accorded familial status with the family Schizopododiae first defined by LeConte in 1859. Subsequent authors have either accepted or ignored this status, although the three major buprestid authorities of the last century, Kerremans, Théry and Obenberger retained it as a buprestid tribe in the system of Lacordaire. The most recent revision and attempt to validate family status was by Nelson & Bellamy (1991), where cladistic analysis supported the four major lineages, with the schizopodids and julodines branching outside of the apparent “true” buprestid line. However, the concepts of Holynski did not accept this familial status and most recently Lawrence & Newton (1995) listed this group again as a subfamily, stating that there was no indication of what group, outside of Buprestoidea, the schizopodid or -podine line was related to. This then highlights one of the traditional problems with higher beetle classification and that is the lack of information relating the higher taxa and defined sister-groups. 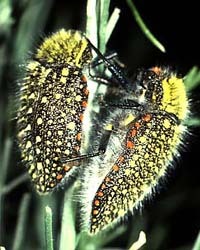 In an interesting 1982 paper on the dryopoid affinities of buprestids, Crowson suggested that a possible candidate for analysing buprestid relationships was the luctrochid genus Lara; indeed these beetles bear a remarkable resemblance to Schizopus in general morphology. This was the out-group used by Nelson & Bellamy, but the lack of defined sister-group still allows conjecture. In fact, in an attempt to provide some modern classication to the entire series Elateriformia, Lawrence (1987) could not provide a clear cut statement of phylogeny at the superfamily level, showing that the results of cladistic analysis indicated that buprestids are probably the sister-group of a monophyletic group comprised of the families Dryopidae, Lutrochidae, Limnichidae, Heteroceridae, Elmidae and Byrrhidae. The schizopodines are a small group from western North America. There are three genera, one subgenus, seven species and two subspecies known from California, southern Nevada, western Arizona and northern Baja California. These beetles possess a primitive wing venation compared to buprestids in general and yet the genital structures of both sexes are highly derived. In addition, the few known examples of larvae indicate primitive locomotory structures suggesting a biology of external root feeding as opposed to the majority of buprestids which develop within wood, stems or leaves of various host plants. The relationship to the second buprestid lineage, the julodines, is supported by this groups external plant feeding habits, although no larvae have any locomotory structures. The wing venation in the julodines is more typically buprestid and while the female ovipositor is highly modified for inserting the eggs into the soil, the male genitalia are also typically buprestid. The julodines are a large group composed of six genera and many species distributed from the southern Palaearctic and Oriental to the Cape region of South Africa. The largest two genera, Julodis and Sternocera, are found as far west as Pakistan and Southeast Asia, respectively. Interestingly, they are not present on Madagascar. The bodies of these insects a nearly cylindrical, tapering to the posterior end, from about 1 to 7 or 8 cm in length. This group is arguably supported at the family level too. The remaining two main lineages, the buprestines and agrilines, comprise the majority of buprestid taxa. The buprestines generally have very typical larvae, each with a strongly dorsoventrally flattened thoracic region, a feature that spawned the dubious moniker flat-headed wood-borers. The typical buprestid body is said to be bullet shaped, but that is a distortion since they are mostly flattened dorsoventrally and again tapering towards the rear end. They are very active flyers, especially during the warmth of the day and are quick to escape both predators and collectors. Many species are found feeding on the foliage of their larval host plants and many other species visit flowers to feed and to rendezvous with others looking to exchange gametes. The range of host plants is rather broad and includes many families of gymnosperms and dicot angiosperms. Many species seem to be generalist feeders as larvae, often known to inhabit several plant hosts, sometimes developing in a variety of dead wood. The buprestines are known from every biogeographical region and most every habitat. The fourth lineage is the agriline line and is comparable in size and taxonomic diversity to the buprestid line and perhaps exceeds it. These beetles are generally smaller, often very small, mostly subcylindrical or flattened and cuneiform or wedge-shaped. The larvae differ significantly in that they lack the proventriculus of the alimentary canal, indicating a very different way of handling the ingested plant material. The larvae also share a modification to the caudal segment, always in one way or another, bilobed, bifurcate and sometimes with this paired terminus sclerotized. 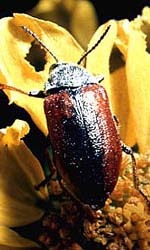 The adults are most always collected from the foliage of their host plants and most seem to be very host specific. In fact, within this group, there are some very pronounced coevolutionary trends apparent with entire species-groups utilizing only one genus of host plant. The agrilines are also known from every biogeographical region and most every habitat, with leaf-mining taking precedence over wood-boring forms in the moist tropical areas as the larvae are much less exposed to the threat of fungal infection. Bellamy, C. L. 1985. A catalogue of the higher taxa of the family Buprestidae (Coleoptera). Navorsinge van die Nasionale Museum, Bloemfontein 4(15):405-472. Bellamy, C. L. 1995. A new subtribe for the monotypic Southern African genus Bulis Laporte and Gory (Coleoptera: Buprestidae). Annals of the Transvaal Museum 36(11):171-175. Bellamy, C. L. 1996. Further consideration of the subtribe Thomassetiina Bellamy: a new species, new records and placement in the contemporary classification (Coleoptera: Buprestidae). Annals of the Transvaal Museum 36:215-222. Bellamy, C. L. & R. L. Westcott. 1996. The phylogenetic placement of two new genera and species of Buprestidae (Coleoptera) from Mexico. Journal of Natural History 30:229-245. Bellamy, C. L. & G. A. Williams. 1995. The first Australian Paratrachys (Coleoptera: Buprestidae), with comments on the higher classification of the genus. Invertebrate Taxonomy 9:1265-1276. Cobos, A. 1980. Ensayo sobre los géneros de la subfamilia Polycestinae (Coleoptera, Buprestidae)(Parte I). EOS, Revista Española de Entomologia 54(1978):15-94. Crowson, R. 1982. On the dryopoid affinities of Buprestidae. The Coleopterists Bulletin 36(1):22-25. Holynski, R. 1993. A reassessment of the internal classification of the Buprestidae Leach (Coleoptera). Crystal, series Zoologica, No. 1, pp. 1-42. Lawrence, J. F. 1987. Rhinorhipidae, a new beetle family from Australia, with comments on the phylogeny of the Elateriformia. Invertebrate Taxonomy 2:1-53. Lawrence, J. F. & A. F. Newton, Jr. 1995. Families and subfamilies of Coleoptera (with selected genera, notes, references and data on family-group names), pp. 779-1006. In: Pakaluk, J. & S.A. lipi ski (Eds.). Biology, Phylogeny, and Classification of Coleoptera. Papers Celebrating the 80th Birthday of Roy A. Crowson. Muzeum I Instytut Zoologii PAN, Warszawa. LeConte, J. L. 1859. Descriptions of some genera and species of Coleoptera from the vicinity of the southern boundary of the United States of America. Arcana Naturae 1:121-128.
evaluation of the family Schizopodidae (Coleoptera, Buprestidae). Journal of Natural History 25:985-1026. Obenberger, J. 1926. Buprestidae 1. In: W. Junk, S. Schlenkling (eds). Coleopterorum Catalogus 84:1-212. Obenberger, J. 1930. Buprestidae 2. In: W. Junk, S. Schenkling (eds). Coleopterorum Catalogus 111:213-568. Obenberger, J. 1934a. Buprestidae 3. In: W. Junk, S. Schenkling (eds). Coleopterorum Catalogus 132:569-781. Obenberger, J. 1934b. Buprestidae 4. In: W. Junk, S. Schenkling (eds). Coleopterorum Catalogus 143:782-934. Obenberger, J. 1936. Buprestidae 5. In: W. Junk, S. Schenkling (eds). Coleopterorum Catalogus 152:935-1246. Obenberger, J. 1937. Buprestidae 6. In: W. Junk, S, Schenkling (eds). Coleopterorum Catalogus 157:1247-1714.